Be the first to share your favorite memory, photo or story of Joahne. This memorial page is dedicated for family, friends and future generations to celebrate the life of their loved one. 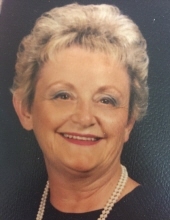 Joahne Estelle (Turk) Fellows, 86, died Jan. 2, 2019 in Okemos, Mich. She was born May 10, 1932 in Cleveland, Ohio, to Joseph and Estelle (Carrier) Turk. She was a graduate of Denison University in Granville, Ohio, where she was a member of the Alpha Phi International Sorority. Joahne met John Anthony “Tony” Fellows of Flint, Mich. at Denison, and they were married June 26, 1954 in Cleveland. Mr. Fellows joined the AC Spark Plug division of General Motors Corp. in Flint in 1955 and worked as a distribution and marketing executive. There the couple started their family and developed many lifelong friendships. Joahne was active in those years in many community organizations, including the Junior League of Flint. The family moved to Petoskey, Mich. in 1969 where Mr. Fellows joined with Wilbur Zipp, Joahne’s cousin, in ownership and operation of the George T. Zipp Lumber Co. She was active in the Petoskey Garden Club. Joahne and Tony retired to Englewood, Fla. in 1990. They were members of the Sarasota St. Andrew’s Society and the First Presbyterian Church of Sarasota, and dedicated volunteers at Sarasota Memorial Hospital. They relocated to the community of Lake Ann, Mich. in 1998, where they joined St. Andrew’s Presbyterian Church in nearby Beulah. Joahne was an ordained elder in the church and served as Clerk of Session. Her husband of 50 years died suddenly July 6, 2004, and she moved to Grand Ledge, Mich. in 2008. There she joined the First Presbyterian Church of Lansing and sang in the choir for a year. She had been a resident of the Ingham County Medical Care Facility since June 2017. She is survived by her sons, John A. “Jack” Fellows, Jr., of Traverse City, Mich. and Mark J. (Jean) Fellows of Grand Ledge; grandsons Nathaniel and John; sister J. Kay Morris of Tampa, Fla.; and nieces Victoria and Alexandra and their families. To send flowers or a remembrance gift to the family of Joahne E. Fellows, please visit our Tribute Store. "Email Address" would like to share the life celebration of Joahne E. Fellows. Click on the "link" to go to share a favorite memory or leave a condolence message for the family.